The sakura blossoms may be gone, but that just means that the cold winds have also gone and the weather is perfect for being outdoors. And in Okazaki, it also means that it is Fuji time (as in the flowers, not “that hill“). 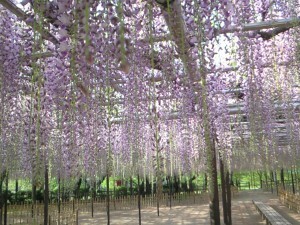 In Japanese, wisteria are called Fuji （藤）. These are particularly beautiful in eastern Aichi & western Shizuoka, and Fuji is the official city flower of Okazaki. The long streams of petals are amazing. 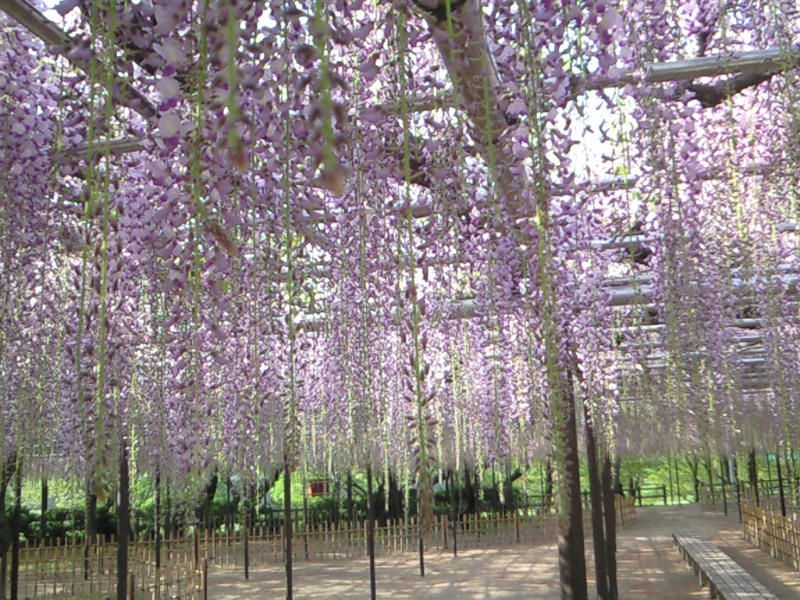 We usually spend an evening each spring partying under the sakura at Okazaki castle, but wisteria flowers are best enjoyed during daylight, so this event (celebrating the beginning of Golden Week) is a picnic starting at 12:30. Daytime also makes it easier to see a flying frisbee. Participation is free, but please bring your own food. We will not have a BBQ today, so please prepare or purchase something ready to eat. Our only request is that you make a “one coin donation” (ie anything from 1 to 500 yen) to our on-going Fukushima donations. There are still over 100,000 people living in emergency accommodation in the Tohoku region, and any assistance is much appreciated. Also, if you wish to participate in a tour of Okazaki Castle, for 1000 yen you will learn much more about the area than you will probably ever need to know. And Declan will absolutely bore you to death with history, and the usual extremely old jokes. Please also bring your own drinks, and do not drink and drive. Location: Okazaki Castle. Same location as our Sakura Hanami party. Just west of the main tower. East bank of the Iga river, about 50-100 meters downstream from Takechiyo bridge （竹千代橋 – the bridge just west of the Wisteria trellis, the last bridge before the small Igagawa converges with the Otogawa). Wet Weather Plan: In the event of bad weather, we will move to one of the cafes/pubs across the river in the Meitetsu Higashi Okazaki Station area.